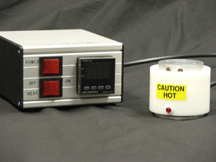 Our Wire Bonding Heat Chuck - Hot Plate. This low profile 2 inches high fits easilyunder the wire bonding arms, Rotation can be easily adjusted by the unit by manuallymoving the unit. the bottom plate is nickel plated to allow for easy slide. TemperatureRange of Ambient +5 Degrees to 300 Degrees C. Optional Vacuum with multipleconfiguration of vacuum rings available. Digital PID Temperature Control with Alarm Band-Cutout.